Senior citizen Felisa Surio Bocboc was honored today, for reaching 100 years old! She was recognized and awarded a cash incentive by San Roque Mayor Atty. Don L. Abalon, and the office of the Municipal Social Welfare and Development headed by OIC Carmila Bantilo. 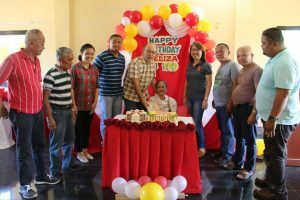 This is part of the LGU’s drive to give importance to its senior citizens through municipal programs such as the ordinance granting incentives and other benefits to centenarians.